QuarkXPress often displays only the controls you need for your current task, and it uses context menus. Context menus are huge timesavers when you haven’t yet memorized the shortcut key for a command. Rather than using the mouse to navigate to the menu bar and search for the command, just Control-click (Mac) or right-click (Windows) anything in QuarkXPress. For example, if you right-click a text box, you see the context menu for a text box, as shown. The context menu for a text box. If the Item tool is active, you see the menu on the left, which includes only menu items for tasks that you might want to accomplish when the box itself is selected. If the Text tool is active, you see the menu on the right, which includes additional menu items related to formatting or inserting text. You can even use context menus to help with using palettes. 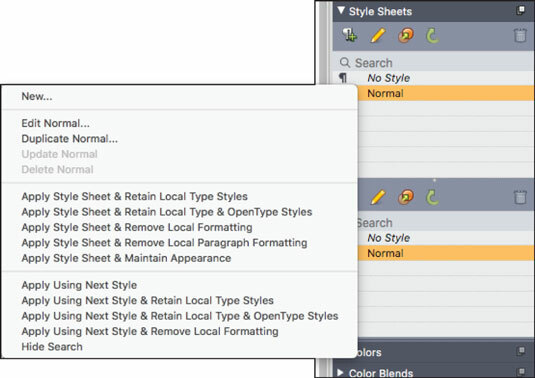 For example, if you are editing text and right-click the name of a style sheet in the Style Sheets palette, the context menu displays options for applying the Style Sheet to the text in various ways, along with options to edit, duplicate, or delete that style sheet, or to create a new style sheet. 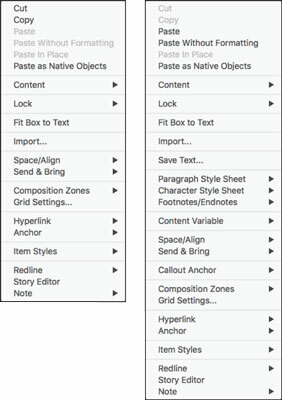 The context menu for a style sheet in the Style Sheets palette.